That’s all she wrote! 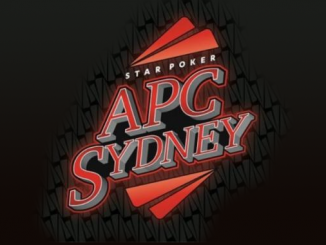 Flight 2 of the inaugural Australasian Poker Championships here at The Star saw a field of 140 players join the 112 who tried their luck on Thursday night with 51 of them making it through the day’s play to progress to Day 2. There were some rollercoaster rides along the way with some huge late clashes seeing big stacks rise and others crumble like a poorly cooked Pavlova. In the end it was David Sanis emerging as the monster stack of the day with 285,700 although Paul Murray with 269,500 isn’t far behind. Incredibly, a total of a six players finished the day with over 200,000 in chips. Others to progress include Daniel Neilson, Errolyn Strang, Billy Argyros, Matthew Wakeman, Dejan Boskovic, Trevor Saunders, Adrian Attenborough, Warwick Mirzikinian, Andy Lee and Chad Awerbuch. 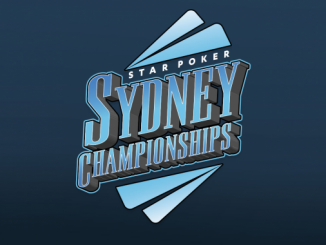 Tomorrow sees the third and final flight taking place here in The Star Poker Room and it’s expected to be a bug one so join us here at PokerMedia Australia from 12.30pm for all the live action! Dealers have been instructed by the tournament directors to deal three more hands only. Once completed players will bag and tag their chips to return on Sunday. Theo Dharmasaputra is off to the rebuy desk as Bruce hall spikes a K on the river for broadway. All in pre flop, short stacks Theo with K5 and Bruce with Q10 find themselves all in and on their feet watching the board flop 75J, the turn A and the river K see Bruce regain the lead and eliminate a player. Jarryd Godena must feel like he’s been mugged after seeing his big stack swindled away in the space of two hands against Paul Murray. Having lost a good chunk to Murray’s JJ a few hands earlier, the two went at it again on a T8J flop with Godena showing AA only to discover Murray held JJ yet again! The board bricked and Godena was headed to the rail while Murray rockets up to 255,000! Andrew Scarf eliminates Jonathan Karamilikis in the final level of flight two after Jonathan commits his remaining 17,000 with KJ on a 4J8 flop, Scarf with A3 needing help gets there on the turn with the board running out A2 crushing yet again JK’s dreams. Paul Murray has just scored a huge double to move to 160,000 following a pre-flop clash with Jarryd Godena. Murray opened the pot and was 3-bet by Godena. Murray then shoved and Murray called. It was a race between Murray’s JJ and Godena’s AK and the board ran out 4565J to fill Murray up and propel him to 160,000. Godena is still in decent shape with 80,000. Players are now taking their seats in what is level 9 the last of the day, blinds will be 600/1200 with a 100 ante. Players are now on their final 10 minute break. We’ve just witnessed a monster pot play out that has seen David Sanis soar into the tournament chip lead with a monster stack of 275,000! The hand began with Jimmy Ghobrial opening UTG and both Andrew Scarf and David Sanis making the call. The flop fell 274 and Ghobrial continued for 7,500. Scarf then re-raises to 15,000 before Sanis announced he was all-in. Ghobrial thought for a while before announcing he was all-in. Scarf folded and the cards were tabled with Sanis having flopped a set of 4s to be way ahead of Ghobrial’s AA. Scarf announced he had folded KK and when no A arrived to save Ghobrial he was left with under 20,000 and a new chip leader had emerged. Dejan Boskovic opened to 2,200 and Billy Argyros called before Jarryd Godena 3-bet to 8,000 on the button. Both players called to see a 7T3 flop. It was checked to Godena who bet 18,000 and both players quickly folded. Godena is up to 190,000. We found Graeme Putt raking in a hefty pot on Table 74, with AA tabled in front of him and a board reading TQ4TK. His opponent didn’t show his cards but was left with only a few thousand in chips and a regretful look on his face. Putt is up to 141,000 with that hand. Daniel Neilson opened to 2,200 in early position and was called by Warwick Mirzikinian and Max Lehmanski. The trio saw an AK8 flop as Neilson continued for 2,600. Mirzikinian called while Lehmanski folded. Both players checked the 9 turn, but Neison led for 3,200 when a 9 repeated on the river. Mirzikinian called and mucked as Neilson tabled AJ. Both players are now sitting on around 90,000. The blinds are up, level 8 – 500/1000 with a 100 ante. The announcement over the PA for the $220 Main Event satellite just confirmed that 120 registered players equals a total prize pool of 100 APC Main Event seats were up for grabs. A short stacked Sam Capra shoved with T3 on a T-high flop but ran into the AA of Errolyn Strang to find himself headed to the rail. Strang is sitting on 100,000. Dejan Boskovic has picked up a big pot and eliminated an opponent holding KK on a 93K flop. His opponent held AA but discovered the bad news once the chips went in with no A arriving to save the day. The final figure for today’s flight is 140 starters – taking the total to 252 after two flights. With a big field expected tomorrow, it seems that The Star’s goal of 400 runners will be easily eclipsed. There are 84 players remaining today with a little under three levels left to play. Players are back from their break and registration for today’s flight has officially closed. Blinds are now at 400/800 with a 100 ante. Just over 90 players remain and are now on a 10 minute break. Daniel Neilson doubles to over 55,000 after turning top set with pocket QQ’s against his opponents AK! We sauntered past Warwick Mirzikinian’s table to find him stacking chips and Corey Kempson counting out his final few. Mirikinian was showing J♣2♣ and the board read 9♦Q♣T♥7♣5♣. Mirzikinian is up to 70,000. We’re about 45 minutes away from registration closing for the day with the current number of players in today’s flight sitting on 135. There are 97 remaining with another three levels to be played after this one. Dinesh Velupillay’s day has come to an early end after he shoved for his last 10,000 with 9♠T♠ and ran into the JJ of David Sanis. The board ran out 97KKA as Sanis climbs back to 130,000. We noticed Jarryd Godena suddenly sitting pretty with 110,000 and it turns out he was the beneficiary of a bizarre bit of charity. The hand in question began with an opponent opening to 2,200 UTG and Godena making the call with 77. The flop came Q87 and it was checked to Godena who bet 3,000. His opponent then check-raised to 10,000 and Godena went all-in for around 50,000. His opponent thought about it before making the call with KJ! Godena couldn’t believe his luck as he climbed into six figures. Frank Ioannidis’s button move with 94 off was genius in hindsight raising 1600 pre flop into his opponent from UTG flat calling to see a flop. The board fell 4♥4♠5♦ giving frank three of a kind and his opponent betting into him on each street with just a smooth call in return. The turn saw the 3♣ and again Franks opponent bet into him with Frank flat calling, the river a 9♦ giving Frank a full house was well received this time re-raising his opponent forcing him all in who after time was called throws his cards in the muck. Frank happily peeling over his Full House and scooping the 35,000 pot and increasing his stack to over 110,000. 5.35pm: Saunders joins the big stacks! A player limped into the pot and received a call before Trevor Saunders bumped it up to 2,200. Both players called and the flop came down Qxx. Saunders c-bet only to be faced with a shove from the limper for around 40,000. Saunders made the call with AA as his opponent rolled over KQ. The turn and river bricked to send his opponent to the river as Saunders soars to 95,000. Players have returned with blinds now at 200/400 with a 50 ante. Players are now on their second scheduled break of the day and will return in 20 minutes. Tom Rafferty got it in with AQ on a 9♠7♦Q♠ flop but needed to dodge plenty of outs against the K♠T♠ of Andy Lee. He didn’t have to wait long as the J♠ on the turn ended his run as Lee chips up to 65,000. Rafferty hits the rail and will have to try his luck again tomorrow. Rick Solomon eliminates Reza Vakili after spiking a two outer on the river. First to act, Rick leads out only to be re-raised to which he flat calls, the board fell 35T and again he leads out only to be re-raised and again making the call. The turn saw a 6 and this time Rick puts Reza all in and he instantly calls. The cards were table with Reza showing top set with pocket 10’s and Rick with pocket K’s, the river fell a K and Vakili sent to the rail with Solomon now on upwards of 85,000. We caught the action on a 2♦3♠7♠7♥6♠ board with Adrian Attenborough firing out a bet of 7,200 and an opponent deep in thought. He eventually made the call but could only hang his head in disappointment as Attenborough showed A♠Q♠ for the nut flush. Attenborough is up to 40,000. Michael Doumani’s tournament life has come to an end after nursing a short stack for far too long. Moving all in on a 923 board with T9, his opponent snap called with pocket JJ’s, unable to improve he has been sent packing considering trying again tomorrow. Graeme (kiwi g) Putt has sent his opponent to the rail after getting his chips in good against pocket AA’s on a 510JK6 board, tabling KJ he scoops the pot and sits on just over 41,000 in chips. Andrew Michael was disappointed to be moved to a different table and away from his namesake – not to mention the fact that his new tablemates included Andrew Lichtenberger, Corey Kempson, Shivan Abdine and Luis Arrilucia. Not to fear – moments after sitting down, Michael picked up 88 and hit gold on a J83 flop. The pre-flop raiser bet out for 2,000 and Michael called. On the turn 3 his opponent bet 5,000 and Michael called. The river 8 gave Michael quads and he shoved when checked to, his opponent snap-calling with AJ only to discover the bad news. Michael moves to a touch over 40,000. Blinds are up to 150/300 with a 25 ante. David Sanis eliminates another after a pre flop raise, his opponent moving all in and David making the call. His opponent peeling over pocket 4’s against his AJ the board read 32QA9 sending yet another player to the rail. David now nudging 100,000. One lucky participant put it all on the line in a single table, single handed, winner take all flip for a seat in the APC Main Event. Interest now being taken for a $440 5 handed flip! 30 minutes into level three and some familiar faces are rising and falling. Last night’s opening flight attracted a field of 112 players but we’ve already bettered that number today with 116 currently registered. We’re still in just our third level of the day with registration open until the start of Level 7, so expect that number to rise considerably. In a strange twist of fate, Table 71 features two players with exactly the same name! Andrew Michael sat down earlier today to find Andrew Michael staring back at him from the other side of the table! Players have taken their seats and blinds have recommenced at 150/300. Joining the field during this level has been Daniel Neilson, Alex Lynskey and his girlfriend Angelina Rich, Gary Benson, Manny Stavropoulos, Matthew Wakeman, Tolly Sakellariou, Reza Vakili and Jimmy Ghobrial. David Sanis has been running pretty well early on and he just took down a nice pot where a bluff turned good. The hand began with an open to 650 and two calls before another opponent 3-bet to 2,650. The original raiser and Sanis both called to see an AJ9 flop. Sanis donked for 4,000 and the pre-flop 3-bettor called. The turn was a 6 and this time Sanis bet 8,000. His opponent called. The river was an 8 and Sanis shoved with his opponent eventually mucking. Incredibly, Sanis showed 57 as the table all leapt to their seats when Sanis showed 57 for runner-runner straight! He is up to 84,000. The German contingent has arrived with Kilian Kramer and Julian Stuer both seated at the same table. The pair boasts a string of impressive live results to their name with Kramer having also finished in 18th at the 2015 WSOP Main Event. About half an hour before the start of today’s play the heaven’s opened and from our vantage point here in The Star Poker Room we have a beautiful view of the rain falling over Sydney Harbour. What better place to be on a day like this? David Sanis finds himself having far too much fun on table 74 having straddled every hand since the start of play. Michael Doumani feeling the heat on the table and is down to 18,100. 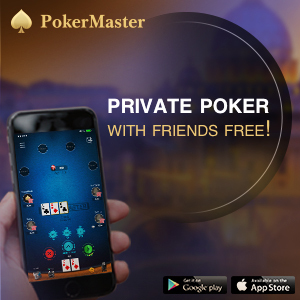 Live reporting for this event is proudly brought to you by PokerMedia Australia partners The Inside Word who provide detailed sports betting analysis, and insightful, independent commentary about local and international sports. Check them out! Blinds have increased for the first time in flight 2 and are currently 100/200. Trevor Saunders and his trusty banana are off to a good start. He just recounted an early hand he played in which Michel Bouskila opened to 350. Saunders, holding A♦K♥, called as did one other player. The flop brought three low diamonds and it was checked to Saunders who bet 700. Both opponents called. The turn was a fourth diamond, giving Saunders the nut flush, and this time Saunders bet 1,600. Both players called again. When the river paired the board it was checked down as Saunders scooped a nice little pot. He is up to 35,000. Plenty of familiar faces are here once again including Tom Rafferty, Sam Capra, Shivan Abdine, Mike Ivin, Graeme Putt, Chad Awerbuch, Errolyn Strang, David Sanis and Michel Bouskila. There are also a number of players taking advantage of the repechage format by firing their second bullet after being eliminated last night. They include John Caridad, Andrew Scarf and Jarryd Godena. 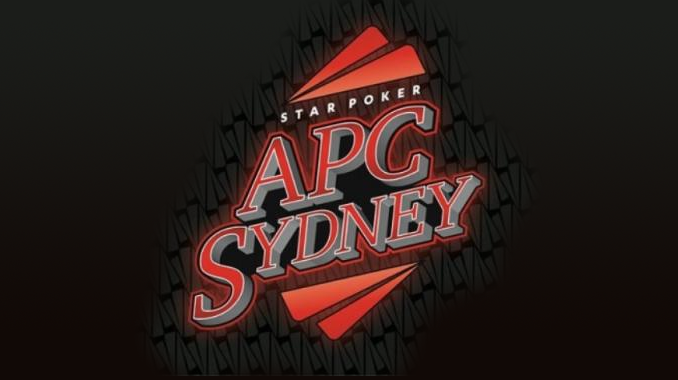 Welcome back to PokerMedia Australia and our coverage of the inaugural Australasian Poker Challenge live from The Star. Last night’s opening flight saw 112 players take their seat with 38 making it through – headed by Alex Falon with a stack of 221,300. Alongside Rined Namrood, they were the only two to top 200,000 in the opening flight and it will be interesting to see how today’s field fares in comparison. We’ll be playing nine one-hour levels today with play to finish at around 10.30pm. As always we’ll be here for every minute of it so sit back and enjoy!